Home boost sales conversion optimisation ecommerce conversion rate exit intent exit intent mobile exit intent plugin exit intent technology What is Exit Intent Technology and How Can It Boost Sales? 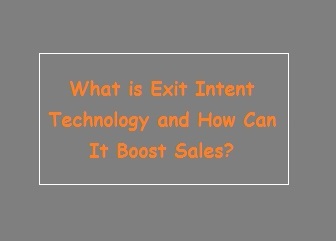 What is Exit Intent Technology and How Can It Boost Sales? When you run an e-commerce site, you want to do everything within your power to make sure that the valuable traffic that your site gets is converted to sales wherever possible. There are a lot of ways that you can use web technology to make your site one where more people follow the sales process all the way through from checking out your products to making a purchase or signing up for a subscription - depending of course on what you're selling. Here we are going to take a look at a technology that has been becoming a lot more prominent on commercial websites in recent years. If it is something that you are not currently using, it may well be worth implementing it as part of your online strategy. The technology we will be looking at is called exit "intent technology" and relates to the behaviors of users on your website when the system detects that they are going to close the tab in which they are viewing your website. What Is Exit Intent Technology and Where Is It Used? Exit intent technology detects the movement of the website visitor’s mouse cursor to identify when they might be heading to click on the close button of the tab they have your site open in. At its most basic, this kind of technology simply identifies when your site is on the active tab, and the person moves to the top of the screen where the tab close buttons will be. Once this technology identifies that someone looks like they are about to leave your site, it triggers a pre-programmed reaction which is usually to display a kind of window called a light box on top of the visual display of the website. This is not a pop-up, and so it's not affected by pop-up blockers, but is instead an overlay on the site that the person is viewing. The lightbox can be used to encourage further interaction between the user and the website. You may well have noticed this kind of technology in use on some of the websites you've visited lately. You may see it on news websites, where the site asks you if you would like to subscribe to their paid area on leaving, on e-commerce sites where the lightbox may offer you a new deal such as free shipping if you stay on the site and continue to shop, or even on non-commercial blogs where the technology may be used to encourage you to sign up for a newsletter or to receive notifications when new content has been added. OptinMonster for example, provides exit intent technology that promotes e-books that are relevant to what your client has just finished reading on your current content page. When you know what you're looking for you'll see that there are a very high number of websites across all different sectors that are now using exit technology. How Can You Add Exit Intent Technology to Your Site? Adding exit intent technology to a website is easy, especially if you use something like WordPress. There are plenty of third party add-ons for WordPress that can be used for exit intent detection and also to configure light boxes and ensure that they fit with the design of the website. There are some good resources for people intend on building a good blog e-commerce site on this website. Adding this new feature to your website and managing the content displayed in your light boxes can be done very simply from the back-end interface you use for content management. Of course, adding the technology itself is only part of getting it to help you keep people on your site to make purchases or do whatever else it is you need them to do for their visit to have been deemed a complete one. Some websites simply ask the user if they're sure they want to leave when the light box appears. This can actually be annoying for the customer because it offers no new information and simply questions their own decision to shut the window. This is why to use light boxes and exit intent technology effectively you need to include some kind of call to action or new information in the message presented to your users when the system thinks they are trying to leave. If you would like your call to action on your light box to be a request for the user to give their email address and sign up for your newsletters for other deals, then presenting them with an easy way of doing this and an incentive is the best way to approach it. Many sites offer things like free ebooks which are delivered immediately on sign up to try and gain email sign ups. The lightbox can be a good place to do this. You can also offer things like codes that will give each new sign up to your email list a discount if you sell physical products from an e-commerce site. Ensure that the form to enter their email address and sign up is already present on the lightbox so they don't have to click through in order to do this. A lot of people may well sign up on impulse just to get the free offer, but they won't be willing to jump through hoops to do this. You can also use your exit intent technology to encourage people to sign up for your Facebook page, follow you on Twitter, or even share the content they were just reading on your website. This can be one of the best ways to use it if your site is not so much selling something as trying to gain readers and traffic. Successful blogs have been able to use this kind of encouragement to share content very effectively. Another good way to use your exit intent technology is to promote a current offer. As an example, you may ask users if they're sure they want to leave because you are currently running a free shipping promotion, and if they buy now they will be able to take advantage of this. It is not necessarily however, a good idea to use exit intent technology to make an offer that isn't available to people who don't see the light box. This can seem unfair, so instead promote an offer that is already available on your website to other customers, or an offer that they can only get by signing up to your newsletter as described above. Whatever type of website you run, whether you are selling products or services, or are looking to build up a following for a specialist blog, being able to target people at the moment when they are considering closing your site and moving on can be a powerful way to engage with them and prompt them to read more content, sign up to your mailing list, or even to make a purchase with a special discount applied. If you are not currently using exit intent technology, you should certainly look into how you could apply this on your own website. It is simple to do, and you may well be impressed with the results. This is very helpful and very good artice.